Overview Atrial fibrillation, AF is a chaotic, irregular atrial rhythm at 300-600bpm; the AV node responds intermittently, hence an irregular ventricular rate. AF is the most common sustained dysrhythmia; characterised by absent P waves, irregularly irregular heart rate, narrow QRS (typically). It is common in the elderly. The main risk of AF is embolic stroke either in the mesenteric artery, brain tissue or limb extremities. Supraventricular tachyarrhythmia: Arrhythmia arising from the conduction system above the ventricles, possibly the AV node, atria or SA node. Atrial Fibrillation: A supraventricular tachyarrhythmia. It is characterised by uncoordinated atrial activity on the surface ECG, with fibrillatory waves of varying shapes, amplitudes, and timing associated with an irregularly irregular ventricular response when atrioventricular (AV) conduction is intact. 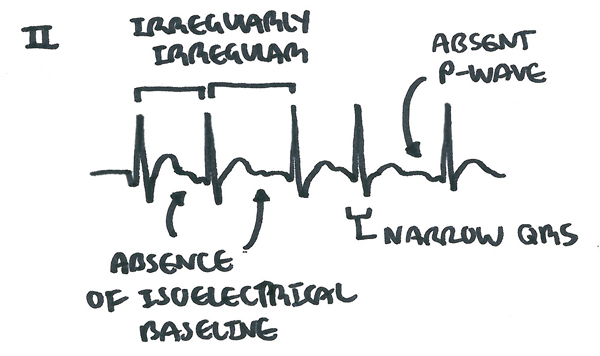 Acute Atrial Fibrillation: Defined as a new onset or a first detectable episode of AF, whether symptomatic or not. Chronic Atrial Fibrillation: is defined as experiencing atrial fibrillation more than once. It may be paroxysmal, persistent, long-standing persistent, or permanent. The cardiomyocytes contract moving blood around and out of the heart. 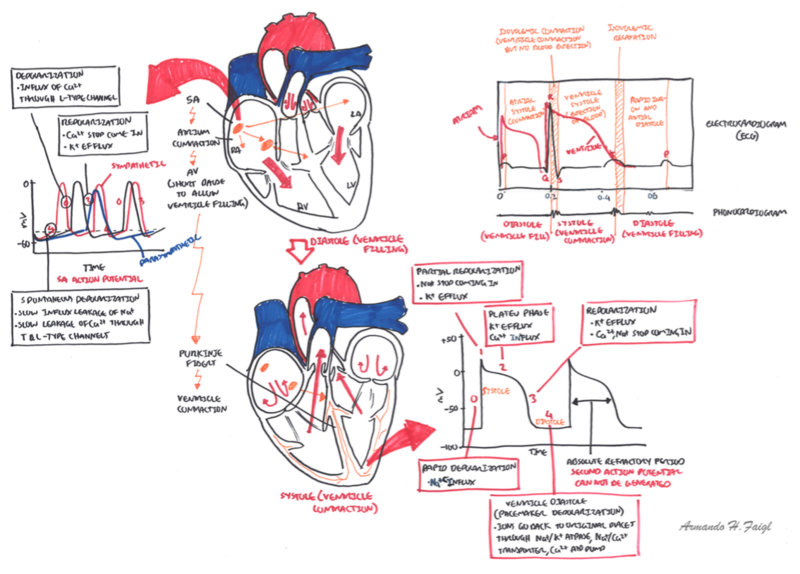 Many factors affect cardiac output, one of which is heart rate. Conduction system The heart rate is controlled by the heart’s own special conduction system. The Sino atrial node (SAN) is the boss and sits high in the lateral right atrium (RA) just below the superior vena cava. The SAN is richly innervated with sympathetic and parasympathetic fibres, which alter the rate of depolarization hence controlling the heart rate. This is also the same for the Atrioventricular node which is found in the RA anterior to the mouth of the coronary sinus and directly above the insertion of the septal leaflet of the tricuspid valve. The AV node then sends conduction signals to down to the ventricles through the his-purkinje system. Three clinical patterns (3Ps) All patterns have a risk of thromboembolism. Remember Chronic AF is having atrial fibrillation more than once. It may be paroxysmal, persistent, long-standing persistent, or permanent. Diagnose AF stable or unstable? If low emboli risk – stop anticoagulant if sinus rhythm normal and risk of emboli is low. Pharmacology Warfarin is an anticoagulant. It is used for AF, valvular heart disease and pulmonary embolism. Mechanism of action: Vitamin K antagonist inhibiting the production of coagulation factors VII, IX, X (these require Vitamin K to be produced). Side effects: Allergy, acute bleeding. When bleeding occurs as a result of warfarin this can be reversed by administering Vitamin K.
Pharmacology Digoxin is used for Heart failure and AF. Digoxin works by inhibiting the Na/K+ pump in cardiomyoctyes, this causes ↑intracellular Na+ together with Ca+ causes stronger contractions at a slower rate. Side effects: Nausea, vomiting, headache, dizziness/vertigo, loss of appetite, diarrhea, Digoxin toxicity (arrythmias). Remember 6Ps of Amiodarone side effects (6Ps): Prolongs action potential duration, Photosensitivity, Pulmonary fibrosis and inflammation, Pigmentation of skin, Peripheral neuropathy, Peripheral conversion of T4 to T3 is inhibited (Hypothyroidism). Prognosis depends on several factors, such as the precipitating event, underlying cardiac status, risk of thromboembolism, and whether the nature of the AF is paroxysmal, persistent, or permanent.